A site that’s currently occupied by a parking lot at the corner of Church and Richmond may soon be home to a mixed-use development. According to a recent zoning by-law amendment application to the City of Toronto, the Madison Group is looking to develop a 45-storey mixed-use residential tower at 114 and 120 Church Street and 59 Richmond Street East. The requested rezoning would permit the redevelopment of the site with a mixed-use residential building with retail and commercial uses. The building would include a total of 567 residential units that are proposed, with a mix of 1-, 2- and 3-bedroom unit types. 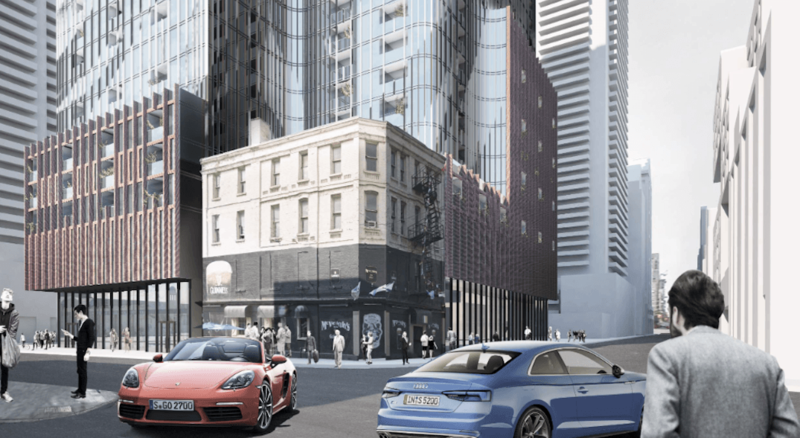 It would also include 129 parking spaces within three levels of underground garages, and 584 bicycle spaces are proposed within the development. The proposal also includes a Privately Owned Publicly accessible Space (POPS) for the southeast corner of the building at Church and Lombard. And it sure beats a parking lot.